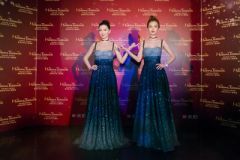 HONG KONG, Feb 7, 2018 - (Media OutReach) - Madame Tussauds Hong Kong today invited Angelababy (Yeung Wing) to unveil her world-first wax figure and became the first actress to join Fashion Zone. Angelababy wore a Dior glittering blue gown and stood side-by-side with her figure, attracting visitors from all over the world to meet her at The Peak. With the curtain opens, two identical Angelababy stood on stage with same poses and same smiles. All media and fans were surprised by the resemblance. Dressed in Dior's stunning starry night blue gown, the figure looks just as elegant as Angelababy herself. The figure stands with "her" right arm akimbo on "her" hip and left arm extended with raising index finger. Angelababy explained that she wants her figure can interact with visitors like friends and this teasing pose is to create a truly fun experience for everyone. She also shared sitting process on the event. Madame Tussauds sculpting team flew to Shanghai to meet Angelababy for a detailed sitting. Although Angelababy just gave birth, she remained her professionalism and communicated closely with the team. Angelababy said, "It is my pleasure to witness the unveiling of my figure. The figure is very impressive and it is my number 2!" Being the first actress features in Fashion Zone, Angelababy showed how to take fashion photographs with her figure and visited the attraction to take a one-of-a-kind cover photo with her figure. The celebrity revealed that it will be the best and most remarkable photo shoot she has ever had. Jenny You, General Manager of Madame Tussauds Hong Kong, said "We are honoured to have Angelababy as the addition to the attraction. She is an excellent role model for everyone. Like what she said, fans can feel free to come and visit her anytime you want. We can't wait to see the friendly interaction between them." To celebrate the launch of Angelababy's world-first figure, Madame Tussauds Hong Kong is pleased to collaborate with Meipai to provide admission offer. From now until 8 May 2018, present valid screenshot can enjoy HK$50 off on 2-in-1 combo (Madame Tussauds + Peak Tram return) or regular-priced admission ticket. For more information, please visit Madame Tussauds Hong Kong official Meipai page ID:1568151791 (the offer is not available on 16-19 February).